Any Windows Machine with .Net 3.0 installed. miniWE is a free .Net3.0 application. It is a combination of Quick Launch Bar and Windows Explore. When you click the program, it will pop up as an app launcher. In addition, it has the ability to browse through folders like a Windows Explore (some folders like MyDocument are not accessible under Windows Security System). When you click on the file, it will be launched by default program and miniWE will be minimized. When you click miniWE again, it will pop back up under your Main Page Folder. 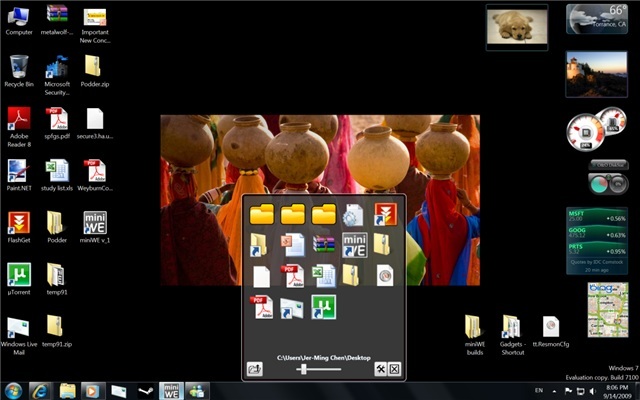 Main Page Folder is default to Desktop Folder as seen in the following picture, but, you can set it to any folder you like. If you have a lot of apps, this is an easy way to organize your apps. No more double click on a folder of shortcuts. No more closing the folder window after you launch an app. You can also group documents and many other files as well. Navigate through folders, open files, launch program 3-in-1. Drag & drop files/folders to add “Shortcut” to main page folder. Main page folder, icon size, column count, and file name display are all customizable. Show picture thumbnails (additionally, one per folder as well). Use the wizard to create more miniWE to target different Main Page Folders. Allow to open main folder right away. 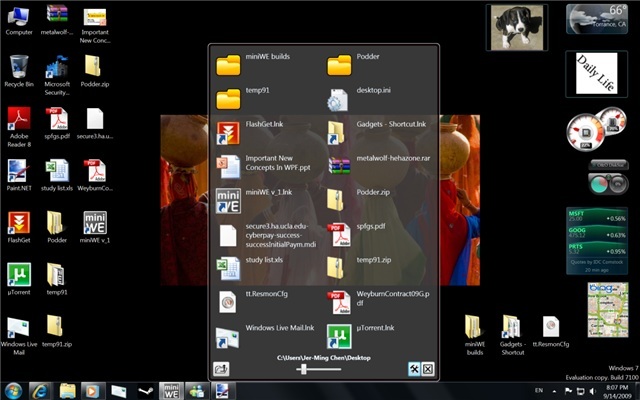 This is a good alternative for pinning a folder in Windows 7. Why Make More miniWE Shortcuts? You can make miniWE points to different folders when you create a shortcut using different ID number. Meaning you can have a miniWE points to Desktop, one to Download, one to My Document, and etc.. And you can customize shortcuts to any icon you like, so, you don't get confused which miniWE points to which folder. Here are the screenshots of miniWE. Picture 1: miniWE will pop up looking like this. Picture 2: Show file names (good for Documents) and set column count (2 columns in this case). Picture 3: Setup Features in a glance.